Everyone knows that there are massive loopholes in the island’s antediluvian property laws. Shouldn’t these be plugged before the banks start selling off people’s homes as demanded by troika? IN A RECENT interview with the media House Speaker and leader of EDEK, Yiannakis Omirou, said that tax evasion was a crime against the people of Cyprus especially under today’s circumstances. He assured reporters that EDEK is ready to vote in additional legislation to stamp out tax evasion. I wonder if Mr Omirou is aware of the loophole in the property laws that enable people to reduce their property tax liability by not having their Title Deeds updated when they erect a building on their land? Is he and his party prepared to stamp it out? I should say from the outset that if you have already bought a house you will not be able to benefit from this loophole. The first thing you need to do is buy a plot of land with a Title Deed. Let us say that this costs you €75,000. You pay the Property Transfer Fees of €2,250 at which time you the secure legal, undisputed ownership of the land and everything on it. The Title Deed will show the assessed 1980 value of the land – let us say it is €7,500. You then build a house on the land, making sure that you obtain all the necessary permissions and permits for the construction to be carried out within the law. Let’s say the house costs you €325,000 to build. Once the house is completed, it is inspected by the Planning Authority and is issued with its Certificate of Final Approval. The land and the house together cost you a total of €400,000 and you can now live in it safe in the knowledge that you have complied fully with the law. The Land Registry will reassess the 1980 value of your property, which could increase to possibly €60,000 – and as the local property tax you pay to your Community, Municipality, etc. 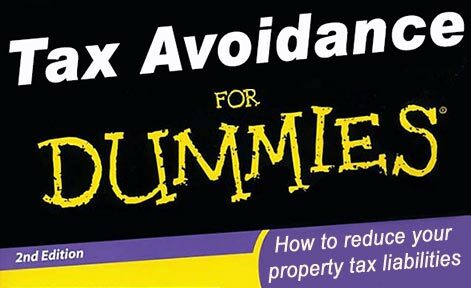 is based on the 1980 value of the property, you will pay more in local taxes each year. Also, if you built a particularly large and luxurious house and it’s 1980 exceeded €120,000, you would also make yourself liable Immovable Property Tax to the Inland Revenue Department. (The Government has proposed reducing the threshold at which this tax becomes payable from €120,000 to €40,000. So even if you have a relatively modest home, you could make yourself liable for this tax). Not registering a house on a Title Deed also makes fraudulent transactions more difficult to uncover – and gives you a competitive advantage should you sell. As the Land Registry does not know that a house is built on your land, you could sell the land and the house for (say) €500,000. €400,000 of this would be paid in cash (‘black money’) and the balance of €100,000 would be the declared sale price on your contract of sale. The Land Registry would probably look at this contract and decide the market value was correct. You paid €75,000 for the land and sold it for €100,000 making a profit of €25,000. But you would need to pay Capital Gains Tax on the chargeable gain. Taking the Capital Gains Tax allowances into consideration, this would be no more than €1,600. Your buyer would also benefit as he would pay Property Transfer Fees based on declared sale price of €100,000 – these would amount to €3,291.40. Had you registered your house on the Title Deed and the sale price declared in the contract of sale was only €100,000, a fraudulent transaction would be easier to spot. Furthermore, if you and your buyer were honest and the sale price declared in the contract of sale was €500,000 (without any ‘black money’ changing hands), your Capital Gains Tax liability could be in the region of €16,500, while the Property Transfer Fees paid by your purchaser would amount to a massive €33,165.59. How much tax revenue is being lost? A well-known authority on local property matters said he suspected that 50% of private buildings/houses were not registered (on the Title Deed) in his newspaper column. How much the government and local authorities are losing through this loophole in the legislation is anyone’s guess. But if half the private buildings/houses have not been registered on the Title Deed, the annual loss must amount to many millions of Euros. The troika must insist that Cyprus changes its antediluvian property laws to maximise tax revenue before it starts insisting that banks should sell of people’s homes that they have paid for in full! Are you up to it Mr Omirou (and troika)? Your last sentence absolutely encapsulates the whole shooting match. Everybody accepts it, Cypriot and Brit alike (how many times do we hear the expression, “This is Cyprus!” to explain away the latest pile of nonsense? I know that I’ve used it many times). The avoidance of the esoteric annual ‘Immovable Property Taxes’ might be small beer compared to a few billion in lost ‘Property Transfer Tax’ (PTT) due to Cypriotic practices that the Troika should be aware of. In the above example the first owner, might illegally seek to evade PTT on re-sale by understating the sales price. A highly risky practice. As a self builder, he has already legitimately avoided thousands in potential PTT on all but but the price of the land. A more naÃ¯ve buyer, who might buy a completed property from a Developer would be liable for PTT on the full contract price including the building. But, then there was always the Cyprian ‘Cancellation and Substitution’ dodge. For years, many developers have not provided Title Deeds to their buyers, leaving ‘owners’ with just the arcane ‘Specific Performance’ charge at the Land Registry. The property then might then be sold on to a third party. For a piece of the action the original developer would facilitate the transaction by cancelling the original contract and substituting a bogus new one between himself and the new ‘owner’. The hapless new buyer would just have a worthless charge against the property, but the vendor/original buyer would have escaped many thousands in PTT on the original sale. As long as the market allowed, this process could be repeated ad infinitum, in a sort of perpetual pass the parcel. Each ‘sale’ representing a substantial loss of taxes to the state. Troika members might also wonder why there are so many buildings with re-bar wire sticking out of the roof. Do the owners and shop keepers like occupying uncompleted properties? A cursory investigation would uncover many millions in evaded taxes. Why has a state with such desperate financial problems not done something to collect this tax revenue? Perhaps because it is a democracy that has a history of electing people who can be relied on to turn a blind eye to such matters? @Alexey Golovanov – precisely – no-one’s going to buy them. They’ll be bought by the proposed â€œCyprus Asset Management Companyâ€ (CAMC) at a heavy discount who will be charged with maximising their return by selling them over the medium term. May I ask a question about the banks selling properties – to whom?